Revere Beach faces Massachusetts Bay, five miles north of Boston. Its hard sand shore forms a great crescent along the blue ocean for miles, sloping away gradually out to sea, creating an ideal bathing beach. 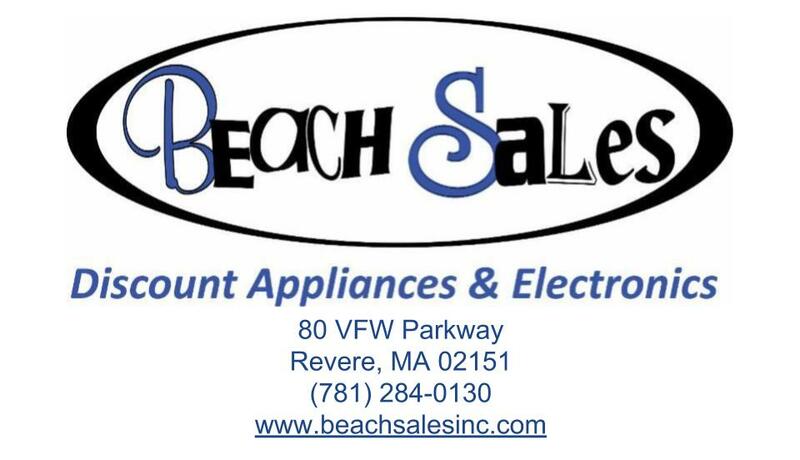 With the Nahant and Winthrop peninsulas framing the horizon, the distant lighthouses and the steamers passing far out to sea, the scenic panorama viewed from the beach by day or night is unsurpassed, described an ad in a 1912 booklet advertising Revere Beach. (Peter McCauley, Memories of Revere Beach 1989). Kevin M. Carey wrote a poem about the history of Revere Beach. This poem summarizes the historical events of this beach quite well. In 1895 the Massachusetts legislature ordered the taking of nearly three miles of private seacoast land on what is now Revere Beach Reservation. The Metropolitan Park Commission was entrusted with the land in 1896. Charles Eliot, a little known landscape designer, was chosen by the Park Commission, to design Revere Beach Reservation for the best use by the public. Charles Eliot was born in Cambridge, Massachusetts. He graduated from Harvard University and trained under the supervision of Frederick Law Olmstead, whose works include New York’s Central Park and the grounds of the United States Capital in Washington D.C.. Eliot stated in November of 1896 that”We must not conceal from visitors the long sweep of the open beach which is the finest thing about the reservation.” It is entirely appropriate that the beach as we know it begins at a traffic rotary known as Eliot Circle, wrote Anthony Moccia, in Peter McCauley’s Memories of Revere Beach book. For more than a century, beginning each year from Easter time until Labor Day, visitors from all over the world were entertained at Revere Beach. In the early years, they walked, bicycled or took horse drawn carriages. Later on, it was convenient to reach via the Narrow Gauge, automobile and thousands would come by ferry. “Revere Beach was the place to go to be entertained, have fun or to just relax and enjoy a day at the beach,” observed noted Revere Beach historian Peter McCauley, during a recent showing of his slide show about Revere Beach. Many of today’s baby-boomers are the children of those who fell in love at the Oceanview or Wonderland Ballrooms. Boomers themselves can still vividly remember the Virginia Reel, Wild Mouse, Dodgems and other rides and amusements. From all over New England, families would vacation at cottages, hotels or even in tents high up on Beachmont Hill. They came to enjoy the Coney Island of the East, Revere Beach. The Boulevard boasted rides, dance-halls, movie theaters, carousels, rollercoasters and all kinds of special attractions. Bluebeard’s Palace, Nautical Gardens, The Pit and the Himalaya were just a few. Hotels and restaurants lined the beach. 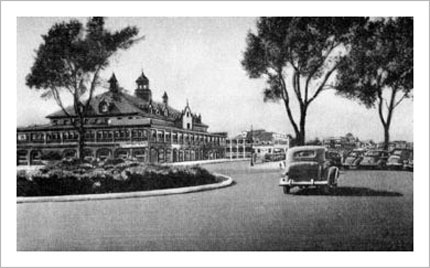 The Pleasanton Hotel, The Strathmore, The Metropolitan and The Point of Pines Hotel were just four of the most noteworthy. President Theodore Roosevelt delivered a speech from the Pines Hotel, according to Jeffery Pearlman, in the Revere Beach Audio Tour, Revere, Fleetwood, 1990. 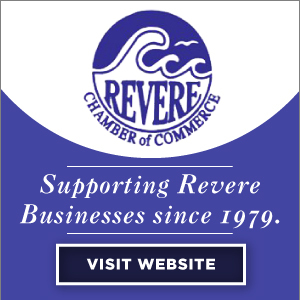 Over the years crowds have enjoyed fine food and dining at many of Revere Beach’s eating establishments. The Driftwood, Barney Scheff’s, The General Edward’s Inn, The Skipper and The Paul Roger House, all featured the finest in seafood. Fast food outlets included Joe and Nemo’s, Howard Johnson’s, Rudolf’s Pepper Steak, Danny’s and of course the world famous Kelley’s Roast Beef. A day at the beach was always an opportunity to enjoy frozen custard at Mary Ahearn’s or Kohr Bros. At Mary O’Neil’s you could get a hot dog and orangade! For pizza, the choice seemed endless; Bianchi’s, Bill Ashes, Anna’s, or the place downstairs at the Nautical were always just great. There was always something for everyone at Revere Beach. On hot summer nights, whole families would sleep right on the beach for relief from the day’s heat. Summer after summer millions of vacationers would come to the ocean resort area to enjoy its natural beauty and to be entertained. 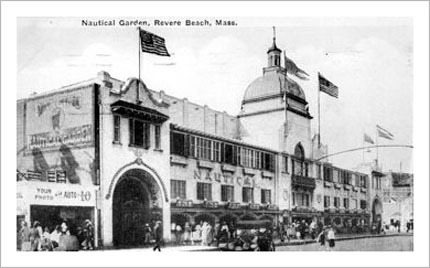 From 1900 until 1988, Revere Beach was well known for its fine dance pavillions. These included the Ocean Pier Ballroom, The Beachcroft, Nautical Gardens, The Frolic, Wonderland and The Oceanview Ballroom. Many people will also remember the Crescent Gardens Ballroom, Spanish Gables and Moorish Castle. Among the famous bands and musicians that performed for dancing were Paul Whiteman, Tommy and Jimmy Dorsey, Guy Lombardo, Louie Prima and others. During the 1930’s, dance marathons were held at Revere Beach, (McCauley, Revere Beach Chips, 1979). Couples would dance for forty five minutes of every hour, from June until October, until the end of the contest. It was not uncommon to see people dancing for more than 1800 hours. Prizes would be awarded to winners, sometimes more than $2000. 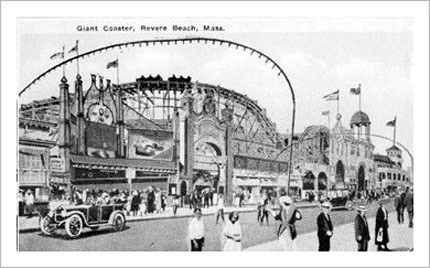 Roller coasters thrilled many beach goers during all the years of Revere Beach’s prominence as New England’s playground; The Tickler, The Thunderbolt, Derby Racer and the Jack Rabbit were just four. Dragon Gorge and the Thompson Scenic Railway were also early favorites. 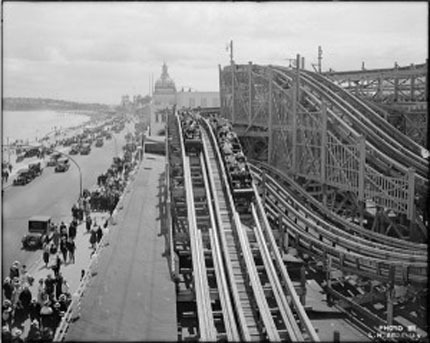 Two of the most famous on Revere Beach were The Lightning Roller Coaster and The Cyclone. 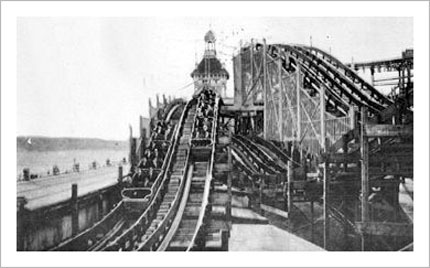 The Lightning was built by Harry Davis and Harry Travers, both accomplished coaster designers. The all-steel coaster was the most terrifying of its time. The only straight and level track along the ride was at the station. Its steep grades and banked curves made it the most unique coaster in the world. Because of its excessive maintenance costs, high taxes, insurance and the Depression of the early 1930’s, it only operated for a few years. The Cyclone Roller Coaster was the world’s most famous. It was built in 1925 at a cost of $125,000. This all wood coaster was built by Harry Travers. Its first vertical drop was 100 feet and riders experienced the thrill of the ride at speeds of 45 to 50 mph. It was the world’s fastest and largest coaster measuring 3600 feet of track. The Cyclone operated for almost 50 years, ceasing in 1969. Carousels provided thousands of children and adults with endless hours of music along the boulevard. Hurley’s Hurdlers, the Rough Riders, The Teddy Bear Merry Go Round and of course, The Hippodrome Carousel, were all magical places to visit. 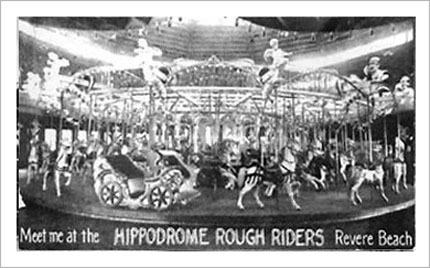 The Hippodrome originally built in 1903, had a platform that displayed three Carousel horses abreast; it was later extended to showcase five abreast making it one of a kind. The organ music of the two Gavioli organs can still be heard with the memory of this majestic carousel which operated until May 1973. 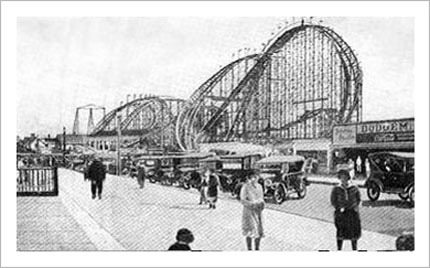 Wonderland Park, Revere Beach’s Mystic City by the Sea, was America’s foremost self-contained amusement park. Conceived in 1905, it opened in 1906. Some people believe it to be the inspiration behind the Disney theme parks of today. The similarities are striking. Wonderland was built on 25.9 acres of land known today as the Wonderland Dog Track. 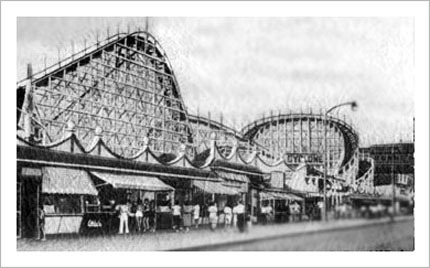 Because of the success of Revere Beach Boulevard, three men worked together to create Wonderland. 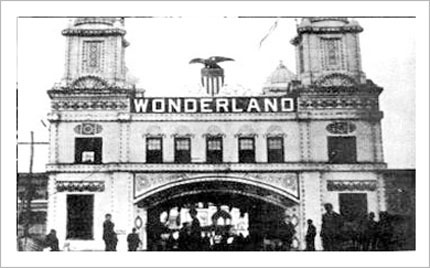 John J Higgins, a commercial real estate broker and Floyd C. Thompson, a visionary with interest in amusements parks, combined their talents with those of another important figure in Wonderland’s history; Major Thomas D. Barroll. Major Barroll had a very distinguished military career and had many skills as an entrepreneur. 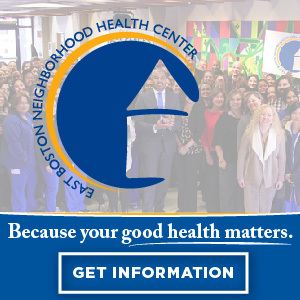 During this career, he had developed many ties to the Boston financial community. Without this critical financial support, Wonderland would have remained just a dream Major Barroll became Wonderland Park’s Managing Director and Chairman of the Board. The centerpiece of Wonderland Park was a beautiful lagoon and part of an elaborate and exciting ride. The ride was called Shoot The Chute; it was one of the most unique in all the world. Passengers would be lifted in their gondolas to the top of a steep grade. Once at the top, the gondola would be dropped down the water slide and back down into the huge lagoon. Like Disney’s theme parks, parades occurred daily. There were international cultural exhibits, demonstrations, educational displays and also scientific exhibits such as the infant incubators at the park’s full service hospital. Wonderland Park existed for just six years. In 1911, because of their aggressive approach to out do previous exhibits and the unpredictable New England weather, its operators suffered great financial difficulty and had to close down. After many years Wonderland reopened as Wonderland Dog Track in 1935. This was noted by Edward and Frederick Nazzaro in Revere Beach’s Wonderland Mystic City by the Sea. 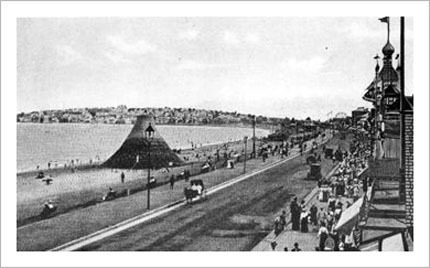 Schedule a time to view the popular “Revere Beach Then & Now Slide Show” presentation. The program features a one hour presentation and description of more than 100 beautiful images of historic Revere Beach and its glorious past. We will share and relive with your audience our collective memories of the rich history of Revere Beach in its heyday! Once again be thrilled to recall the special memories that we share of Rotherhams Red Indian popcorn, Moxie, Korr Bros. Frozen Custard and of course Kelley’s Roast Beef. Many will remember the wonderful Big Band music always heard at the Dancehalls of Revere Beach such as the Oceanview Ballroom, Ocean Pier or at the Frolic nightclub. 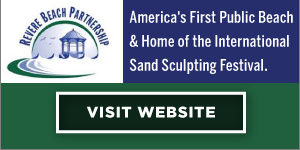 Recently designated as a National Historic Landmark, Revere Beach is now officially recognized as “America’s First Public Beach.” Revere Beach holds a special place in the collective memories of thousands of folks throughout New England and the United States. 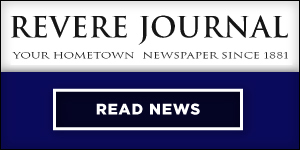 Thanks for your interest in Revere Beach and its great history. 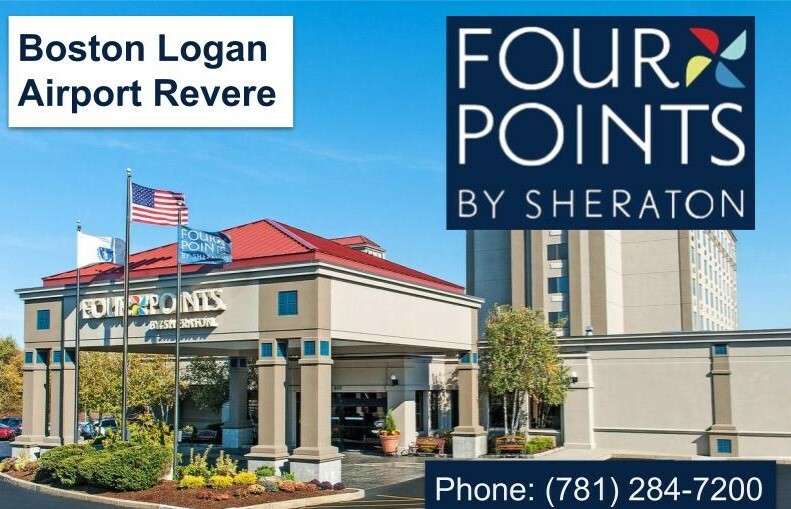 Here is a listing of major historical point of interest of Revere. Belle Isle Marsh Reservation is the largest surviving salt marsh in Boston Harbor. It showcases plants and wildlife now rare to the Metropolitan area. Chelsea Creek was the site of the Revolutionary War’s first naval battle in 1775. The Church of Christ (also known as Revere Masonic Temple) is a historic church building added to the NRHP in 1984. Immaculate Conception Rectory is a historic Roman Catholic rectory added to the NRHP in 2002. Mary T. Ronan School is a historic school added to the NRHP in 1982. The Revere City Hall and Police Station was added to the NRHP in 2012. Rumney Marsh Burying Ground is a historic cemetery added to the NRHP in 2004. Winthrop Parkway, Metropolitan Parkway System of Greater Boston is a historic parkway added to the NRHP in 2004.